On June 25, more than 250 lupus activists from 30 states and the District of Columbia converged on Capitol Hill to ask Members of Congress to support increased lupus research funding and access to treatments. These activists participated in 173 meetings with Members and their staffers. In addition, activists from all over the country took action by sending more than 3,500 messages to Capitol Hill to tell their lupus stories and reinforcing the requests that were being made in person. We asked Erin Kotecki Vest from Los Angeles, one of the many activists to join us in Washington, DC, to reflect on her advocacy experience, including a meeting at the White House. From the day I was diagnosed with lupus, I knew I had to do something. My family Googled the disorder and found very little information. And what they found scared the hell out of them. When we finally got some good info from the Lupus Foundation of America, we were told research was scarce and drugs for the disorder even more scarce. As I lost organs to surgeries and struggled with pain and fatigue and went from doctor to doctor, a lupus advocate was born. As I continued to rely on my husband for support to get me through those tough days and to just pick up the slack around the house, a lupus advocate was born. As my young children visited the hospital time and time again, or were rushed to a friend's house while Dad drove me to the emergency room, two little lupus advocates were born. As part of the National Lupus Advocacy Summit, my family and I dipped back into my "other" life...the one I had before lupus changed it all. You see, I was (and still am when I feel well enough) a political blogger and social media strategist for BlogHer, Inc. Which basically means I took care of relationships with those important people in DC that make those important decisions and I managed things like Twitter and Facebook all for a living. I loved my job. I can not wait until I'm well enough to return to my job. And I'm not one to sit still very well. So it occurred to me that I know some pretty darn important people, and they just might be able to help. After all, I do share my life online and millions have watched me go from interviewing President Barack Obama to an IV in my arm, receiving treatment, twice per month. And I KNEW more needed to know about auto-immune disorders and chronic illness. The toll is takes on our lives, on our finances, on our loved ones. So I made the call. Or, more accurately, I sent the emails. And without hesitation the White House accepted my offer to sit down with my family, and a representative from the Lupus Foundation of America, to hear OUR story...and yours. They want to help. They want the new Affordable Care Act to help. And we are all going to work together to make sure everyone stays informed on how to put the new healthcare.gov information and site to use for those who need it. But just as importantly...they listened. They listened as I talked about what many of us go through: the multiple doctors before we even know what the heck we're dealing with. The bills that never end because we don't have a cure, just ongoing treatments, the endless toll on our support systems- if we even HAVE support systems. And with wide eyes, like so many others, they listened with sympathy and awe learning for the first time what it's like to have lupus, an autoimmune disease, a chronic illness. I also want to note that we were lucky enough to sit down with our own Congressman Buck McKeon. The Lupus Foundation of America folks set up the meeting and my family and I happily accepted. We need all the allies we can get in this fight- lupus is non-partisan. Congressman McKeon was gracious and asked us many questions about the disorder. We, in turn, asked him to support HR 460 – The Patients’ Access to Treatment Act. I truly hope and EXPECT his support. 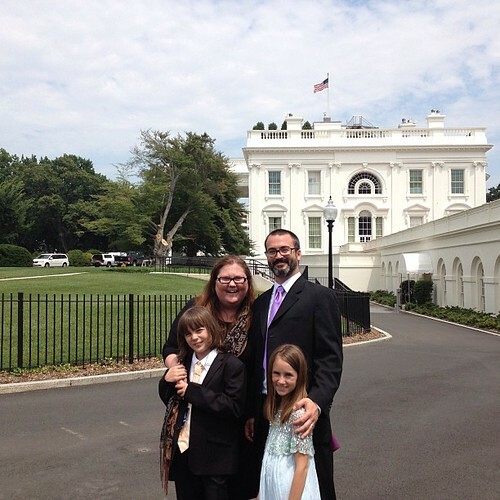 Lupus advocacy reached the White House this week and that is just the start. Now the real work begins as we turn our advocacy into funding, research, and relief for all of those- myself included- who suffer. Editor's Note: It is not too late to make your voice heard. Visit our legislative action center to contact your Members of Congress today! I also want to thank you for what you have doe and been able to accomplish for yourself and all Lupus patient's. Its fantastic. My 23 year old daughter was diagnosed 10 years ago with Lupus and over lap Arthritis. Breaks my heart. I pray for her and others who suffer from horrible chronic and acute illness and for a cure. God Bless you!